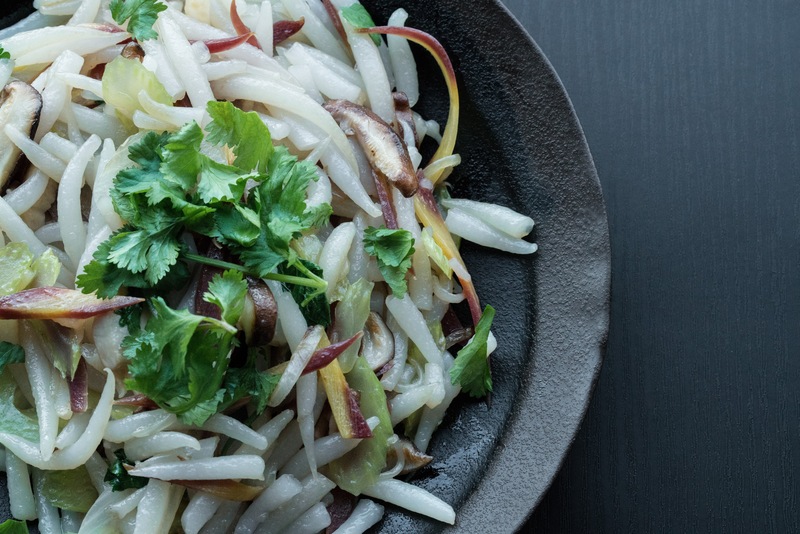 You can stir-fry celery, carrots, ginger, and onions to get a really traditional Chinese flavor profile. This combo is used in pretty much every chow mein you buy at a Chinese deli. I would love grabbing a to-go box of chow mein for a quick snack, but unfortunately, they all have some type of chicken or pork in it. That’s tragic because these to-go meals were so cheap to grab ($3) in San Francisco, Chinatown. So now I’ve improved the dish to include fresh shiitake mushrooms to give an even better spin on a classic dish. I guess it’s not so bad that I can no longer frequent the Chinatown to-go spots. After all, who knows how long those noodles have been sitting there anyway. I stir fried some rice pin noodles which can easily be coated with flavor and holds texture really well. You can basically do anything with these types of noodles and when I serve them to guest, they love ’em. Prepare and slice all aromatics, mushrooms, and julienned carrots. Add 1 tbsp of oil to Wok and swirl until close to smoking point. Throw in 1 garlic, 1 slice ginger, 1/4 onion slices. Cook for 2 min then add shiitake mushrooms and cook until nicely browned. Set initial ingredients aside. Heat 2 tbsp of oil in Wok over medium heat and add remaining onion, celery, carrots, and garlic and cook until fragrant (2 minutes). Place noodles in wok and turn up the heat to high while tossing noodles. Add tamari and sesame seed oil to noodles and mix until evenly heated and seared for 2 min. Add mushrooms and fold into noodles.